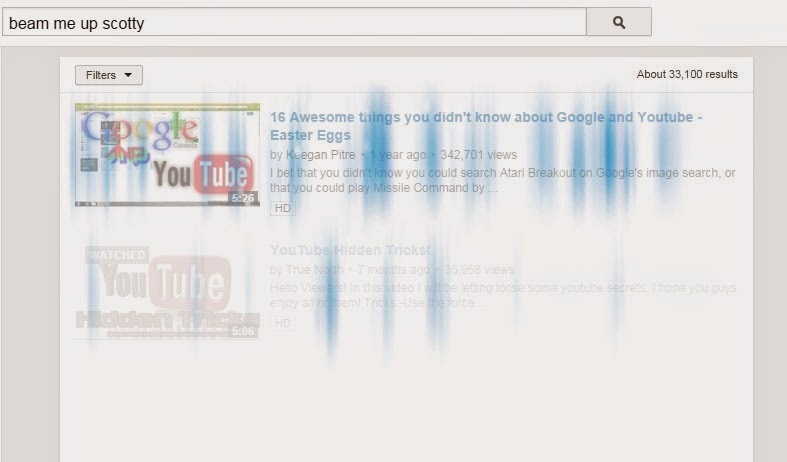 So you're looking for some amazing hidden and secret Easter Eggs Tricks on YouTube. Check out this post to see the list of all YouTube Easters. Easter Eggs are hidden and secret stuffs which are created by developers, programmers, developers which are added and inserted in their website or any software to provide some fun and pranks with their users. If you're a regular visitor of SpicyTweaks than you should be familiar with the previous post in which I shared Some Hidden Google Easter Eggs. With the numbers of visitors visiting that post it was very popular. Today, In this post I will share you some Hidden and Secret Easter Eggs created by YouTube developers. These Easter Eggs Tricks are present on Search Pages and Video Page. For today, I will show you some secret Easters present on YouTube Search page. Lets check out these interesting stuffs now. Open the YouTube homepage and search for Beam me up Scotty and see the result. You'll see a Star Trek Affect on search result, which will be shown until it reaches pagination. See the image given below to know more. You'll see blue color waves going down and the wave will disappear when it reaches pagination. Wasn't the above YouTube Easter Eggs Interesting? If you're hungry of fun until now than check out another Easter which can be revealed by searching the following on YouTube. Any idea of this trick? Search for Use the Force, Luke on YouTube and see what happens next. See the screenshot attached below. After searching the above keyword on YouTube, you'll see that the whole pages starts to shake and it will appear that the page is dancing. And the search results will move and shake in accordance with the direction of your Mouse Cursor, try moving your cursor here and there and see the result. It is a Internet Meme in which a group of few peoples performs a comedy sketch based on excerpts from the songs Harlem Shake. Search for Do the Harlem Shake on YouTube and wait a few moments until the page loads. You will notice that whole pages starts shaking and dancing with the song playing in the background. The song can be paused by clicking the pause button (see the button in the right side of YouTube Logo). If you didn't get this YouTube Easter Egg working than you might have slow Internet Connection. It isn't over yet... Check out the below little less interesting Easters on YouTube. Search for Doge Meme on YouTube and you'll find that all the fonts have been converted into Comic Sans and have different color. See the screenshot given below. Last! But not the least. Search for more YouTube Easter Eggs on Google and you'll find many more. 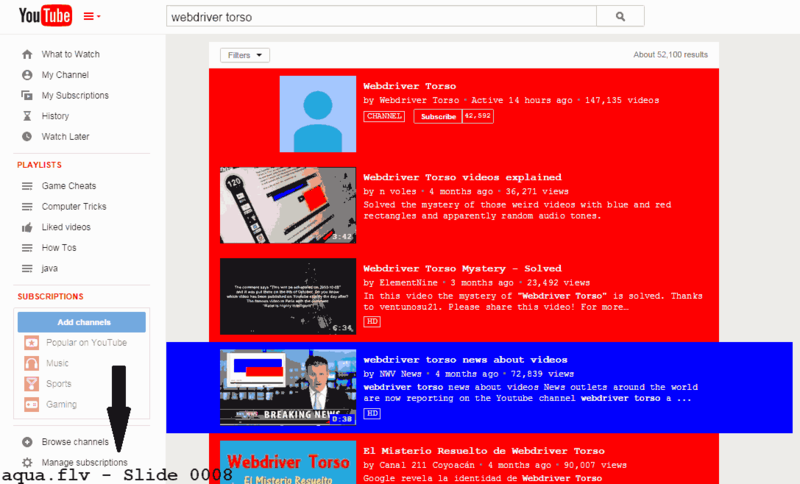 Now search for Webdriver Torso on YouTube and after that you'll see the search result page which will look like the image given below. Search result background will be converted into red background and few results in blue color. Also, you'll notice aqua.flv - 0008 (& counting) written on the bottom left corner. That's All! Keep visiting for tweaks and tricks.